Viewing your Snapshot Reports is a breeze. 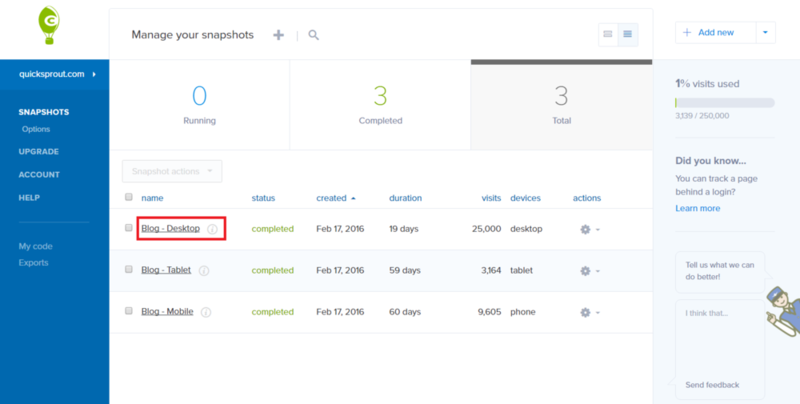 Reports can be viewed at any time after a Snapshot has been updated with data. Newly created Snapshots will take a few hours for the status to change from Pending to Running as we start to collect data. It will only change to Running when at least one visitor has gone to your website. Once a Snapshot is running, data will update every 4-6 hours for the higher plans, with daily updates for the lowest plan. There are five different types of reports that you can explore. To view the results of your Snapshot, simply click on the name of your Snapshot from your dashboard (or select View results under the gear symbol). Note: The link to view results will only be available once there has been data tracked. Welcome to your Reports view! 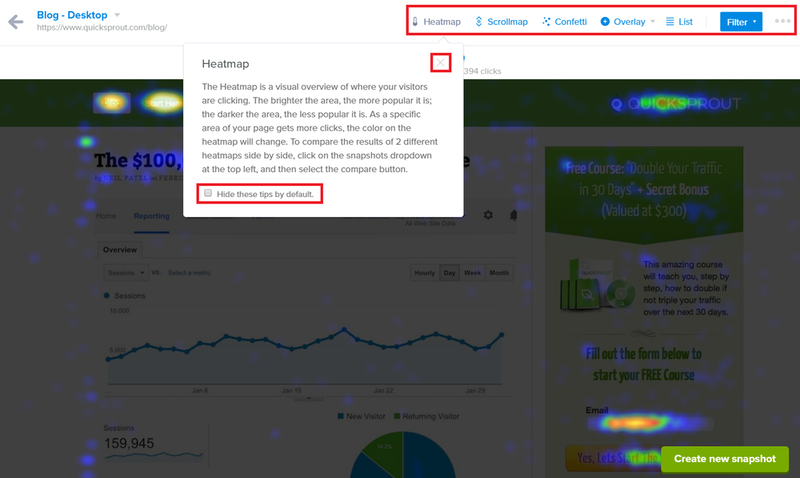 When you arrive, you will default to a display of your first report - the Heatmap. Note: When viewing reports, a helpful tip box will pop up. If you do not wish to see these tips, place a checkmark in the box beside "Hide these tips in the future." To reactivate the tips, click on the ellipsis (...) in the top right-hand corner and select show tips. 3. There are several options along the top right-hand side that allow you to view different reports. For more information on these reports, visit our reports center.